Liz Williams is a masseuse who had been looking to get out of the small town where gossip is too much and clients are too few. Her hand is forced when she loses her job due to the business closing and walks into the right salon on the right day in Fort Wayne. The job may be temporary but it gives Liz time to make plans. Those plans don’t involve dating clients. Firefighter Torrunn MacKay is a temptation but he has a girlfriend and is living the life of the single guy who has it made. Getting involved would be a really bad idea for both of them. Bad ideas can sometimes be a lot of fun. 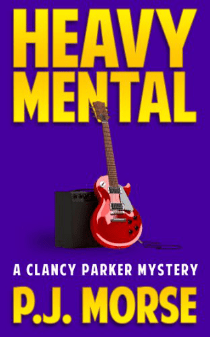 In [easyazon-link asin=”1939403243″ locale=”us”]New Math Is Murder[/easyazon-link] newly divorced local newspaper columnist, Colleen Caruso, is ready to get back in shape. She dons her jogging gear sets out and literally trips over the dead body of the local algebra teacher. Who wants him dead and why? As suspects multiply Colleen tries to stay away but then the mega-hot new editor wants her to write a column following the investigation. How can she say no? As the investigation progresses perhaps the better question is how can she survive? In To Catch a Creeper by Ellie Campbell, Cathy and crew are back with a new mystery. Cathy is settling well into her job at a prestigious London ad agency when she takes on a new mystery — The Crouch End Creeper. Cathy’s group of moms, the Wednesday Once Weeklies, are ready and eager to assist track down the culprit but with Cathy how can things not go spiraling out of control? Armed with Steele by Kyra Jacobs, Jessica Hartley gets going, nothing can stop her and she’s determined to find the cause of the accident that nearly took the life of her best friend. All roads seem to lead back to Maxwell Office Solutions and Officer Nate Steele is hesitant for Jessica to get involved until he has no other option. Can Nate and Jessica delay the distraction of the heat burning between them to get to the root of this mystery? In The Red Suitcases: An Inspector Castle Investigation by Lyndsey Norton, Inspector Rebecca Castle has a full plate — with terrorist Fakesh in town, Geoff marrying a woman she’s sure is after his money, and her husband on leave from Iraq. Can she juggle her busy life and stop a terrorist who is leaving red suitcases in transportation terminals. The Red Suitcases: An Inspector Castle Investigation is the first novel in the Rebecca Castle series. In Severe Clear by Stuart Woods, a government agency monitoring transmissions between Al-Qaeda operatives hears a transmission with two English words—The Arrington. Coincidentally, a hotel named The Arrington that will cater to the rich and famous is opening soon on the grounds of an estate once owned by famous movie star Vance Calder after whose widow the hotel is named. Stone Barrington, second husband of the late Arrington Calder, sharp-as-a-tack lawyer and general all around ladies’ man finds himself pulled into international intrigue to keep the Presidents of the U.S. and Mexico safe when they grace the hotel with a historic meeting on opening day. Severe Clear (Stone Barrington) is the twenty-fourth novel in the Stone Barrington series.